First it was Sony optioning the rights to Bloodshot, then it was J. Michael Straczynski scripting a Shadowman adventure series for Sean Daniel Company (The Mummy), and now comes news S.D.C. are also producing a movie on buddy comedy / action series Archer & Armstrong. 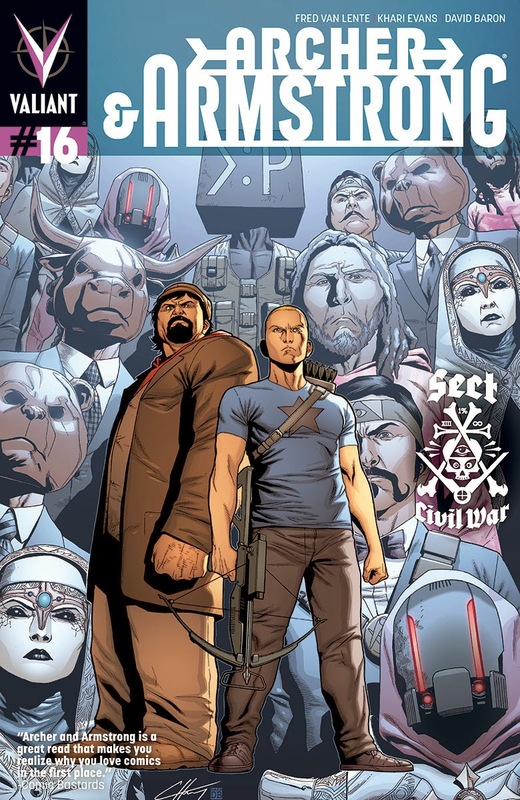 One of the funniest comics on the stands today, thanks to the writing prowess of Fred Van Lente no less - A&A, has from the revamp, detailed the plight of Obadiah Archer. A young man raised from birth to kill an adversary set upon bringing the apocalypse. Only thing is, in place of an adversary he finds Armstrong, a man who wants to drink all the beer in the world rather than end it, and the Sect which Archer comes from, the true threat. Valiant has funded the development thus far themselves, according to THR, and a script by BenDavid Grabinski (Cost of Living) is already in hand. With three films on the go and the likes of X-O Manowar, Harbinger and Rai still in the tank, the Valiant movie-verse future looks pretty darn bright. THIS is the one I've been waiting to hear about. :). The best idea I've heard in a long time. Thanks Random - yeah I think a decent humour buddy movie is always worth the price of admission aye. Especially after the bru-haha success of Guardians.